IT'S been an ongoing battle to detach The Boy from his Thomas the Tank Engine babywalker since he learned to walk on his own two feet. So Thomas the Tank Engine was condemned to languishing in the garden covered in mud and occasionally being dragged out for the boy to rattle noisily up and down the street while shrieking like a banshee or, even more excitingly, filling it with mud before rattling it noisily up and down the... well, you get the picture. But the Thomas the Tank Engine, erstwhile babywalker, has now been rehabilitated and reintegrated into society and The Boy is even quite pleased about it. 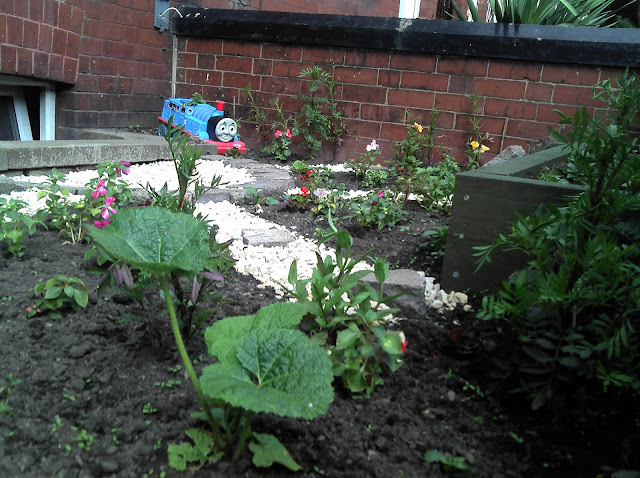 Now it squats serenely in the corner of the newly redesigned front garden. Denuded of it's handle, steering wheel and seat, it's even had holes drilled into it's bottom and now it functions, to all intents and purposes, as a plant pot.